This magnificent view is what I saw from the roof of Portland Tower last Tuesday, access courtesy of owners Bruntwood Properties. In the centre is the clock tower of the Town Hall, and in the distance, the towers of Salford Council's high rise blocks of flats at Pendleton. Bottom left is a temporary canopy covering the roof of the Yang Sing building, burnt out recently. Centre far left is the Midland Hotel, and just to the right of it is the circular Central Reference Library. The big building next to it is the Town Hall extension. Below the clock tower are facades running along Mosley Street, and the old building with the flat pyramid roof is the City Art Gallery. At the very bottom can be seen the square at the heart of Chinatown. The green and brown building over to the right is a new addition to the old Bank of England building, on King Street, and to the far right, the white building is the Midland Bank, King Street. On the far upper right, you can just see the hills north of Bolton, rising to Winter Hill. Home Page of the author Easter Greetings from Manchester, which this morning was basking in glorious sunshine, though by the afternoon, snow was falling in some areas. More below. But first an important note. As from Tuesday 14th of April, Eyewitness in Manchester will be changing from one big weekly update to frequent smaller updates throughout the week. Manchester news items, photos and information will be added to the top of the page as they become available. There will be new features, including QTVR panoramas - exciting 360 degree views. Using a digital camera, and conventional film processed in small batches, pictures will be online within hours or minutes. Visit whenever you like throughout the week for a taste of Manchester - I hope it'll the next best thing to being here. The New Eyewitness in Manchester page will go online sometime tomorrow. As ever, your comments will be much appreciated. In the meantime, to round up the old-style page, here's a short summary of a few of the things that have been making the news in Manchester over the past seven days. The Royal Yacht Britannia won't be coming to Manchester. It was decided to send the vessel to Leith near Edinburgh. (I thought as much!). There were commiserations for Manchester from George Robertson, the minister overseeing the decision. Is this another example of the north west being given unfair treatment? A new multiplex cinema has opened at Rochdale's Sandbrook Park. Coronation Street's Alf Roberts, alias actor Brian Mosley attended the opening. The cinema has a "Gracie Fields" bar, to commemorate the Hollywood star who was born in Rochdale one hundred years ago. Films currently showing in Manchester include Anastasia, House Hunt, Sphere, Twentyfourseven, Jackie Brown, the Man in the Iron Mask, Titanic, As Good as it Gets, Flubber, Good Will Hunting and many others. We're going to see Anastasia. 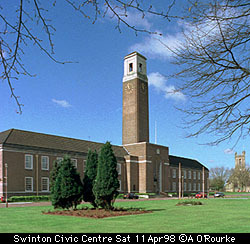 Here's a picture of Swinton Civic Centre, as requested by Graham Booth in Sweden. Does anyone know if there is an identical building elsewhere in the country? Coming back to Coronation Street, the "Free Deirdre" campaign has been reaching absurd lengths - a small plane flew over Manchester city centre last week trailing a "Free Deirdre" message, and near the village of Rainow, near Macclesfield, someone had plastered a similar slogan on the hillside. It seems Deirdre may soon be out - new evidence is about to be revealed! The Spice Girls have given their concerts at the Nynex Arena - and there were reports that one of them was shopping on King Street yesterday! Wow! Didn't catch her unfortunately. I'm not always in the right place at the right time with my camera! A period of silence was observed on Saturday at the club where murder victim Nick Centi had been out with friends. Money collected will go to the family of the victim, and may be used for a reward. He died after being stabbed outside Deansgate Station on Whitworth Street last week. Club managers and city leaders want to try and ensure that city centre streets are safe 24 hours a day. And in the early hours of Friday morning, a death occurred in Bolton town centre. Mark Ashworth, aged 21, from Astley Bridge, died from injuries suffered after a fight. Police are asking club-goers to provide information. It's sad to have to report such stories, but I think I can say that the vast majority of people here spent a pleasant Easter long weekend. It's been a case of winter and summer in one day today. The morning started off cold and sunny, though as the day progressed, the clouds started to form. Still, at Tatton Park this afternoon, there was, despite the cold wind, a "start of the summer" feel, with large crowds, a funfair and other attractions. But by late afternoon snow showers fell. It was the same story yesterday, when I took this picture in the hills near Whaley Bridge. And if you're wondering, yes, the "snow" was added by me to recreate what I saw when I took the photo. The temperature outside is now 2 degrees celsius, around 35 degrees fahrenheit. The forecast is for more showers and cold temperatures. Thanks for the pictures of snowy scenes (even though you had to struggle to find any this year!) they were greatly appreciated. No news on the Boddingtons babe though....what about some shots of those schoolgirls in short skirts....ONLY JOKING!! but seriously linking the photos you put on the page to the stories could bring them to life a bit more help people relate to the stories maybe even jog peoples memories- help them put names to places etc (as you started to do with your cityscape shots). I'm glad you have restricted the national news to a few lines - it's relevant local content that we look to you for. Paul McGuinness The QTVR 360 degree panorama will be available very shortly. The comment about linking the stories to the pictures is valid, I'll try and do that. I'm so glad I found your page...although the links at the beginning didn't work. I loved the comment about the new Longsight Police Station! My mum used to work at the old one prior to her death in 1988. I am a resident of Norway and a Mormon so your description was so appropriate!! Sorry about the links, but very glad to receive your message! A note about Strangeways. My grandfather used to take me past there when I was young, in the 1930's. and tell me "if you do anything wrong,you will get out in there, and only get bread and water" Needless to say I remembered that very well and if I ever had a thought of wrongdoing, that straightrened me out.